Being unemployed is not fun. 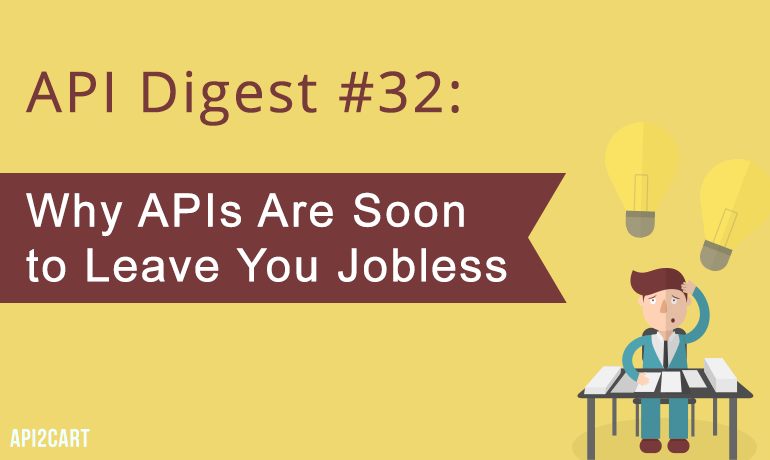 The news is, APIs are about to take your job over. Find this and more surprising topics reviewed in this week’s API digest. APIs are soon to leave you jobless. There are at least 12 common roles that researchers believe have a 99% likelihood of being eliminated by API automation. Find more details in Human vs. API: When Remote Software Competes For Your Job. Luke Stokes knows exactly why your colleagues still don’t understand hypermedia APIs. It is because they are taught to work with Hypermedia APIs the wrong way. To continue the topic of hypermedia, Kin Lane believes the biggest obstacle for its adoption is the cognitive load of the average API designer. Connecting every company in the world has to do with XML and the Universal Business Language (UBL). Interested to find out more? Do this by reading Bill Doerrfeld’s piece on the topic. Sometimes building an APIs takes no more than 10 minutes. If this sounds insane to you, assure yourself by dipping into Pete Gamache’s article. It turns out even non-developers can create APIs. How? Kin Lane indicates using popular form services, Zapier, and Restlet is just enough. If you are exposing your API to be used publicly, you may want to limit its usage because of various reasons such as expensive computation, limited resource or the monthly cost of requests. API throttling is what will help you do this. Read more in API Throttling to Protect Your Resources by Engin Yöyen. Fancy reading something advanced? Give a try to HTML Drag and Drop APIs. Come back in two weeks for more API insights. And in the meanwhile, share the API Digest with your friends, subscribe to our newsletter, and make suggestions by sending us an e-mail.